I am sucker for beautiful packaging. And for well-designed products. I know companies spend ungodly amounts of money on research and development of product and packaging. Yet, even though I'm aware of the strategy behind it, I can't help myself. I simply enjoy a beautiful box and a brilliantly designed product when I see one. For me, great packaging is one that is innovative and clever, stylish and pure, with an inviting label that gets my heart racing and gets me excited to discover what's inside. I find that I am often inspired by the beauty of the products (and beauty products) I use everyday. But what I enjoy above all is when a well-designed product has the ability of triggering an emotion. 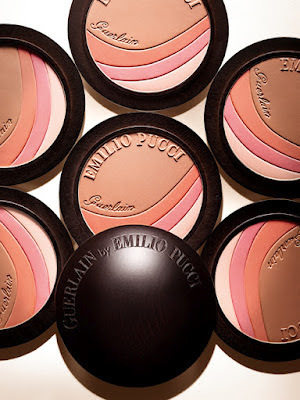 This is exactly what Guerlain has done with its latest makeup line. As of one the oldest perfume houses in the world, the House of Guerlain has released over 600 scents since its creation in 1828. It has expanded into the field of makeup in 1984 by launching their famous meteorites, an illuminating powder that softens features and delivers radiant complexion. 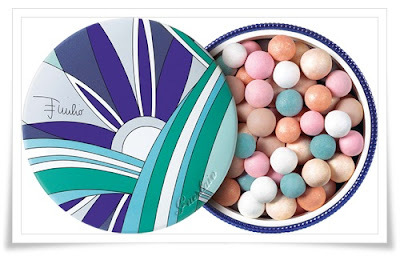 For their 2012 summer collection, Guerlain has collaborated with the house of Emilio Pucci for the second time to create a limited makeup edition, the Terra Azzurra. This new line is a pure work of art. The structure, the lines, the colors, the entire design is stylish, feminine and elegant. It is an invitation to celebrate the "dolce vita" on the Italian Riviera, an ode to a warm and festive summer on the Mediterranean coast. To dress the key product of its latest collection, the Meteorites Perles d'Azur, Guerlain has used a motif inspired by an iconic Pucci print, "Winter Capri". The famous blue geometric motif is also printed inside the boxes containing the other products from the collection. The "idylle" between these two prestigious houses of fashion and beauty is epic. Designed by the Creative Director of Guerlain, Olivier Echaudemaison and Laudaumia Pucci, Image Director of Pucci, the Terra Azzura collection is the epitome of glamour and luxury. And it is now officially on my summer wishlist!